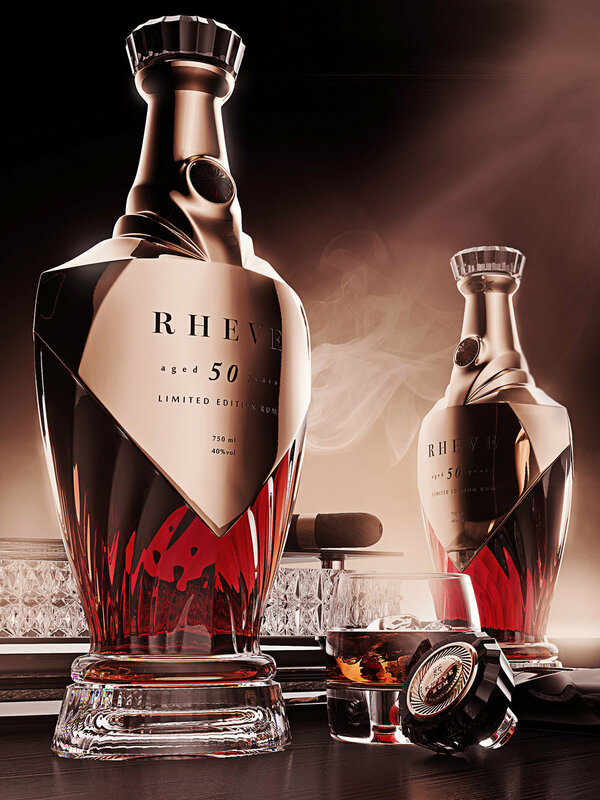 Luxury rum concept bottle Rheve is inspired by the shape of the sugar cane leaves, which are visually imprinted through a waved, sculptural stylized surface on the lower portion of the bottle. The execution would be crystal glass with hand painted golden layer. The stopper is of crystal glass as well, with a metal plaque glued on top. Closure system within the cap is Vinolok. Manufacturing price per one unit of raw cast from the hot end is around 70 - 80 eur, in minimum order of 1000 units. Fewer units can be ordered for finalization, which would include the hand painted golden coating. Price of a finalized piece would be around 120 - 140 eur. Price of the cap including Vinolok would range from 7 - 8 eur. Price of a metal mould with a test run for the bottle ranges in around 18 000 - 22 000 eur depending on the factory. The concept is available for sale, price of the design and transfer of IP is 18 000 €. The price includes one trip to factory.